South Korea’s economy found itself in a prolonged deadlock in July, as its long-stalled domestic market failed to gain upward momentum, in contrast to the steady growth of the outbound sector, data showed Wednesday. The static trend of the market price index also weakened the recent speculations that the central bank may increase the policy rate within the year. The country’s exports in July stood at $51.88 billion, growing 6.2 percent on-year and rebounding from the slight fall in the previous month, according to data compiled by the Ministry of Trade, Industry and Energy. The progress, which was due to outbound sales of chips and petrochemical products, marked the second-largest monthly figure, as well as the first time that the country’s monthly exports exceeded the $50 billion mark for five consecutive months, officials said. As of July, the country’s accumulated exports so far this year reached a record high of $349.1 billion, up 6.4 percent on-year. With imports climbing 16.2 percent on-year to $44.88 billion in July, Seoul’s trade surplus stood at $7.01 billion, marking 78 straight months of surplus, the ministry said. Leading the trade uptrend was outbound shipments of semiconductors, which soared 31.6 percent to $10.38 billion last month, reflecting steady sales in the United States and China. Steered by strong global oil prices and consecutive demand hikes, overseas sales of petrochemical goods also rose 24.1 percent to surpass $4 billion. While the global economic recovery is expected to act as a favorable factor for the country’s exports, trade protectionism and related disputes continued to pose potential risks, according to the ministry. “We will exert efforts to minimize the (negative) impact that the US-China conflict may have on our exports,” said Minister Paik Un-gyu. In contrast with the relatively stable progress in outbound shipments, however, was the sluggish domestic market index, which remained at a lower level than the central bank’s target figure. Data released by Statistics Korea showed that the consumer price index in July climbed 1.5 percent from the previous month. This on-month growth fell below the Bank of Korea’s yearly target of 2 percent -- a figure largely regarded as a key precondition for money-tightening rate hike actions. Announcing a revised set of economic forecast in mid-July, the BOK said that this year’s consumer price growth rate would reach 1.6 percent. Core inflation, which excludes volatile oil and food prices, was predicted at 1.4 percent. Despite the gap, the BOK said that core inflation for the second quarter of this year reached 1.8 percent, nearing the 2 percent mark, a perspective that was largely taken as a rate hike signal. According to the BOK’s report released Tuesday, four out of the seven members of the Monetary Policy Board -- including Gov. 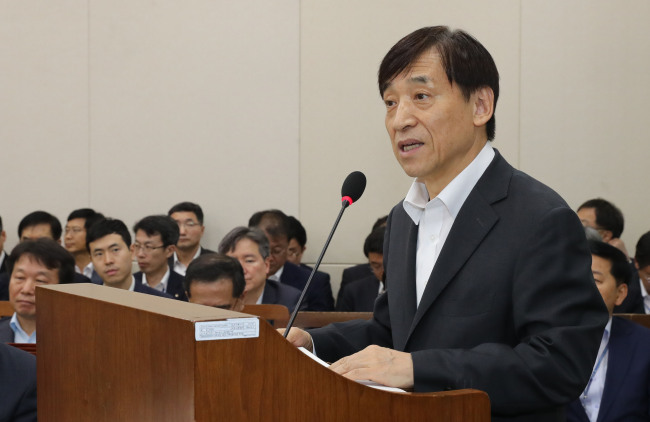 Lee Ju-yeol -- suggested that a rate hike is necessary in a near future to address incumbent economic agenda. If the board agrees on the hike within the year, the move is most likely to occur in October or as early as in August, as the BOK reviews the rate every two months and has seldom made drastic changes in the final month of the year. Global investment banks and economic institutes, however, remained pessimistic on immediate rate hikes. Goldman Sacks said that the BOK would take a cautious stance in August, responding to the slow inflation, while the Nomura Research Institute predicted that hawkish members of the BOK’s board would wait for further signs of base inflation before taking tangible action.